One of our favorite events each season didn't disappoint, as two veterans added titles to their collections, while two other JBT regulars got their first taste of JBT victory, at the JBT Tournament of All Time Champs and simultaneous Tournament of Future Champs, held at Let It Roll Bowl in Phoenix. Keith Fung began the all- U21 scratch champions stepladder finals with a 232-222 win over Kyle Duster. In another terrific match, Russ Oviatt then beat Fung 225-223 to advance to the title match. 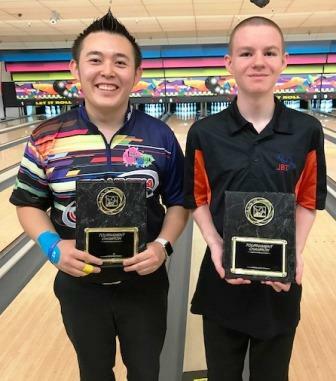 Top seed Dallas Leong, with a resume stacked with JBT majors, earned the top seed, and defended it with a tenth frame strike to beat Oviatt 216-212 for the 17th title of his terrific JBT career. Mark Sauve began the handicap champs ladder with a 250-185 win over New Mexico's Matt Ross. Sauve then snuck by Alyssa Tucker 198-184 to move on to the title game. Top seed William Robbins has had a brilliant season, and made a brilliant shot in the title match tenth frame, needing a double to win, but a ringing-10 stopped him, and Sauve claimed his second JBT title (and second major) with the 223-206 result. Chris Tucker was awesome in the scratch non-champs ladder, beating Josh Mabry 224-152 and Catelyn Croutch 246-169 to get to the title game. Top seed Brandon Rouse needed to strike to win, and got the break of his career with a brooklyn, becoming a JBT champ with the win over Tucker. 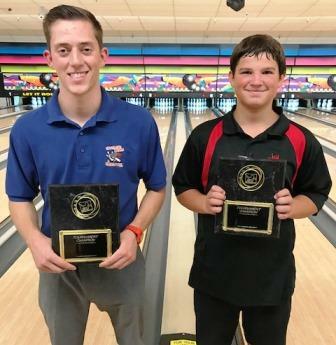 Keith Ylvisaker also bowled like a multi-time champion in the handicap non-champ event, beating Jadeyn Mabry 281-193, and Kyle Perry 250-195. Top seed Gavin Holter was fantastic all day, but Ylvisaker could not be stopped, as he blasted past Gavin for the title and became a non-champ no more. Thanks as always to Let It Roll for hosting us!